Originally published in Spanish on December 22, 2015. The explanations that have been given range from the consequences of the fall in international commodity prices, to offensives from the right and mass media, considered allies of United States policy. These are undoubtedly true, but they are not enough to explain the deterioration of the progressive governments. Few analysts mention rampant corruption in Venezuela and Brazil, and tend to blame almost everything on the “enemies” of these governments. It’s true there is an undeniable economic crisis in Argentina, Brazil, and Venezuela, with significant drops in GDP and rising unemployment and poverty chipping away at some of the greatest achievements of these governments. However, we must not generalize too much. Although there are common causes, the particularities have weight. The Brazilian crisis is closely linked to the de-legitimization of the political class, while in Venezuela the economic crisis is the key to the government’s defeat in parliamentary elections. “How did we get to such a scenario of near ruin?” journalist Eric Nepomuceno asks, in trying to explain the Brazilian situation (La Jornada, December 20, 2015). His answer is “coalition presidentialism”, since it imposes purely pragmatic alliances on the administration that run counter to its convictions. But the Maduro, Correa and Fernandez governments with parliamentary majorities are also experiencing serious difficulties. Although these examples do not invalidate the analysis of the Brazilian case, they do require us to look to common problems. The fall of commodity prices, persistent inequality, and increasing distance from sectors that previously backed the governments seem to be the principal factors that apply to all these progressive governments. When the price of a barrel of oil rose above $120, and mineral and soy prices were high, no one thought that they could someday fall, or rather, return to their “normal” levels. These were years of euphoria and promises that never left the paper. Hugo Chávez took office in 1999 with a barrel valued at just over ten dollars. The price saw a steady climb in the following years, with an abrupt interruption after the crisis of 2008 when it fell from $140 to $52, returning to more than $100 in a few months. But oil prices have gone downhill for more than a year, without indication of a recovery anytime soon. Ecuador exports at $28/barrel; extraction is estimated to no longer be profitable under $20/barrel. The problem is that governments did their budgets with oil prices above $100/barrel, and now cannot find a way to plug the hole. The story of soy is similar: at the beginning of the 2000s, the price fluctuated around $200/ton, rose to above $600 in 2013, and fell to $350 in 2014. Similar patterns appear in the historical prices of every major commodity. Gold hovered above $1800/ troy ounce, to settle out at around $1,100 today. A longterm look at prices shows this to be a matter of a speculative bubble. Although they are not returning to their average values of the preceding decades now (between 1970 and 2005, gold averaged was $345/troy ounce), it’s unlikely we´ll see a return to those extraordinary prices. The Federal Reserve also began to raise interest rates, which were near zero for seven years, to revive the US economy after the 2008 crisis. Rates are expected to rise gradually throughout 2016, putting an end to the era of cheap money, and aggravating the situation of countries and families in debt. The commodity bubble increased dependency on easy money, as if income earned were a hard drug. More than 95% of Venezuelan export is oil. Production in Brazil and Argentina reverted to raw materials. Immense export surpluses were not used to diversify production, but to boost consumption. In the absence of realistic planning, bafflement ensued. Arguments to explain the drop in oil prices were more ideological than economic or political. Some said it was a ploy by the United States to punish Russia, Iran and Venezuela, its principal enemies. Others claimed that Saudi Arabia was behind low prices to discourage the huge increase in US production by fracking. The truth is that oil production is higher than demand today, partly because China’s growth has fallen from 9-10 to 7% percent annually. 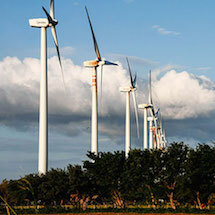 But above all because of a shift toward growth based on new technologies and lower consumption of non-renewable energy, areas in which China is at the forefront. Asia will not continue to grow based on raw materials and cheap labor, which shakes up the world. For South America, the combination of low export prices and the rising price of money is a ticking time bomb. A recent report by the Friedrich Ebert Foundation in Brazil notes that almost half of family income (46.5%) is dedicated to the payment of debts, compared to only 19.3% in 2005. “This makes it impossible to stimulate the economy,” said economist Ladislau Dowbor. Brazil is the regional norm. There are 900 million credit cards and the number of bank accounts has grown 179% since 1999. So-called “financial inclusion” mostly benefitted the banks, which became more and more concentrated. At the close of the virtuous cycle of commodities, families are more dependent on the financial system since they spent much of the social benefits on household consumption. At the same time, health and education did not undergo substantial changes. Some recent studies belie progressive discourse on the fall in inequality, particularly in Uruguay and Brazil. While poverty diminished significantly from the peak of the crisis, there are more continuities than shifts in inequality. The work of economists at the Uruguayan Institute of Economics and the Brazilian Institute of Applied Economic Research on the 1% percent highest earners reach the same conclusion: inequality remains largely unaffected and even has tended to increase slightly in the current crisis. The picture that emerges from these studies shows poverty falling notably in the early years of the new century. This coincided with economic growth and the implementation of social policies. But in the second half of the decade, the decline in poverty slowed. This seems reasonable since it the second half faced the hard nuclei of poor, and not just those sectors impoverished during the last crisis. But inequality almost didn’t move. As the current crisis expands, much of the so-called “conquests” are being eroded by inflation, as has happened in Argentina since 2013. In Brazil and other countries in the region, unemployment is growing while wages tend to stagnate. In short, the end of the cycle has brought much uncertainty and a sense of lost time, since there were no major structural changes or diversification in production models. The social movements that played a prominent role in the de-legitimization of neoliberalism in the 1990s have weakened. Many became recipients of state funding and have dulled their militant profile. Others have joined electoral politics, and not just a few have disappeared. The Argentine piquetero movement that shook the country in the early 2000s no longer exists, fragmented between these three pathways. But new movements are born, and others re-activated. 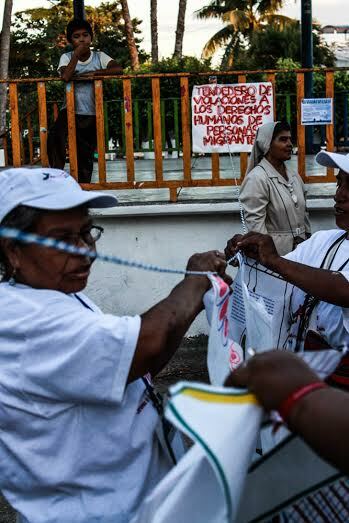 In the indigenous and workers’ uprising in Ecuador this August, the Confederation of Indigenous Nationalities of Ecuador (CONAIE) confronted the Correa government. In a rare occurrence, the CONAIE organized the biggest protests in years against governmental authoritarianism. In Brazil, a new breed of movements was born in the heat of the June mobilizations of 2013. Hundreds of small groups in middle-class neighborhoods and poor favelas hit the streets. The recent wave of student occupations of more than 200 high schools in Sao Paulo stands out as a sign of new times. Most of the countries are seeing a new activism, quite different from that which was forged in the 1990s and found its point of reference in the social forums since 2000. This new wave is less ideological and more concrete in its demands, but no less forceful, as demonstrated by the Sao Paulo students who drove the government to shelve a plan to restructure the education system that would have closed 90 schools on the periphery and concentrate youth in large, overcrowded schools. It looks like a new consciousness is being born, largely a product of the social policies of progressive governments. In Rio’s favelas, for example, college students abound, whereas twenty years ago you could count them on your fingers. With them, actions linked to NGOs have multiplied, but also grassroots theater, black culture, women’s groups, and micro-economic enterprise groups. New organizational skills have been developed out of the demonstrations of 2013 that is reflected in the occupations. And there’s also a sense of dignity that will get people talking in the future. Throughout the region, the voice is clearer and clearer. 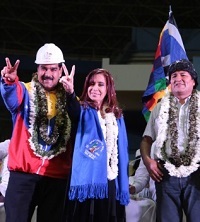 The pages of Aporrea, a publication traditionally sympathetic to Hugo Chavez’s political current, show a very different picture of Venezuela in recent months: corruption, inefficiency, and poor government management are cited openly. 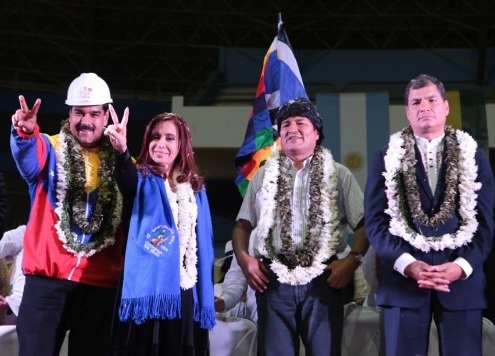 Writer Luis Brito García, always faithful to the Bolivarian process, just published a controversial article in which he concludes: “Revolution without ideology is a piñata, where all kneel until the candies are gone” (Aporrea, December 20, 2015). If it is true that the candies are running out, hard times may cause desertion or reflections that go beyond the pat on the back. Because the numbers tell the story: chavismo lost two million votes while the opposition gained only 400,000. A punishment vote as hard as it was necessary. Raúl Zibechi is an international analyst for Brecha of Montevideo, Uruguay, lecturer and researcher on social movements at the Multiversidad Franciscana de América Latina, and adviser to several social groups. He focuses on the South America region and issues of autonomy and grassroots movements. He writes the monthly “Zibechi Report” for the Americas Program.